are NOT kigo, but topics for haiku. Many trees have leaves in all seasons.
. Leaves in all seasons . are usually the subject of "hunting for them". Red maple leaf, red maple leaves. 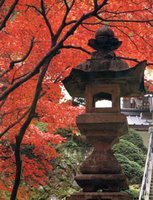 Red autumn colors, and other translations are possible. The word maple leaf (kaede no ha カエデの葉) is not a kigo. 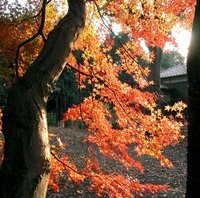 shita momiji, shitamomiji 下紅葉（したもみじ） lit. "lower momiji"
. 竜田姫, Princess Tatsuta of Autumn . "plant to make me love my wife"
. leaf month, hazuki 葉月 (はづき) .
. hazukijio 葉月潮（はづきじお）tide of the eighth lunar month . 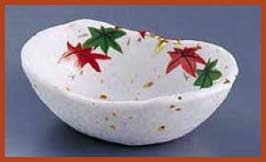 usumomiji, usu mojiji 薄紅葉 (うすもみじ ) "thin red autumn leaves"
another name for the two stars of the Tanabata Star Festival. 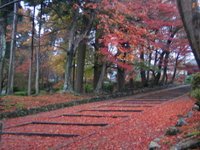 momiji no tobari 紅葉の帳（もみじのとばり） "balance book in red" like the autumn leaves. 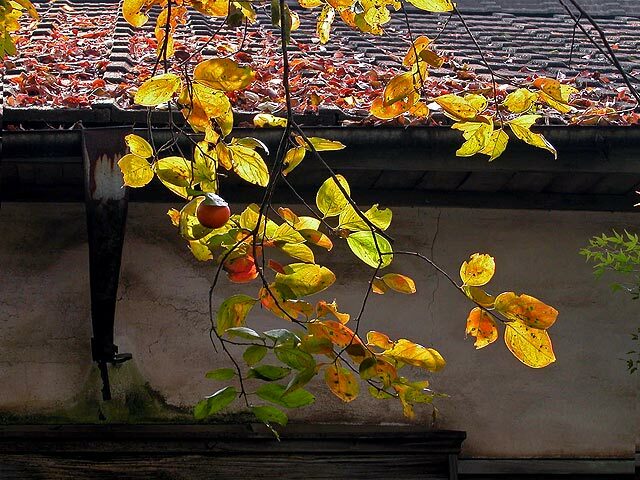 During the rituals at the Imperial court, whith the music of koto and other instruments.
. kaji no ha 梶の葉 (かじのは ) paper mulberry leaf .
. momijizuki 紅葉月（もみはづき）month with red leaves . kooraku 黄落 (こうらく) "yellow is falling"
. Kaede 楓 Maple Tree . Please read the entry about the human activities for further explanation. Literally: Carp like red leaves.
. Fish in Autumn . 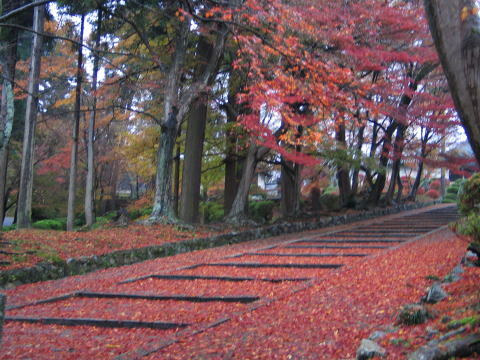 Kooyoo ki 紅葉忌 (こうようき ) "Red leaves memorial day"
Koyo was a novelist, his most famous novel was Tochiman Doo. Now I will add some more pictures and haiku. At the temple Daiyuu-zan 大雄山 in Kanagawa Pref. A carpet of colored leaves. Look at a lot more autumn pictures. This has also been the subject of poetry since olden times. This refers to the menfolk of Edo. There were two famous momiji spots, but one was close to the pleasure quarters of Yoshiwara 吉原 and the other further down, also near the cheaper pleasure quarters. So . . . when the menfolk took off with the excuse of enjoying the red autumn leaves, . . .
. momiji manjuu もみじ饅頭 bean paste buns.
. Momiji tenpura 紅葉の天ぷら tempura from maple leaves .
. WKD : Musashino Plain 武蔵野 . Look at my leaf collection here ! 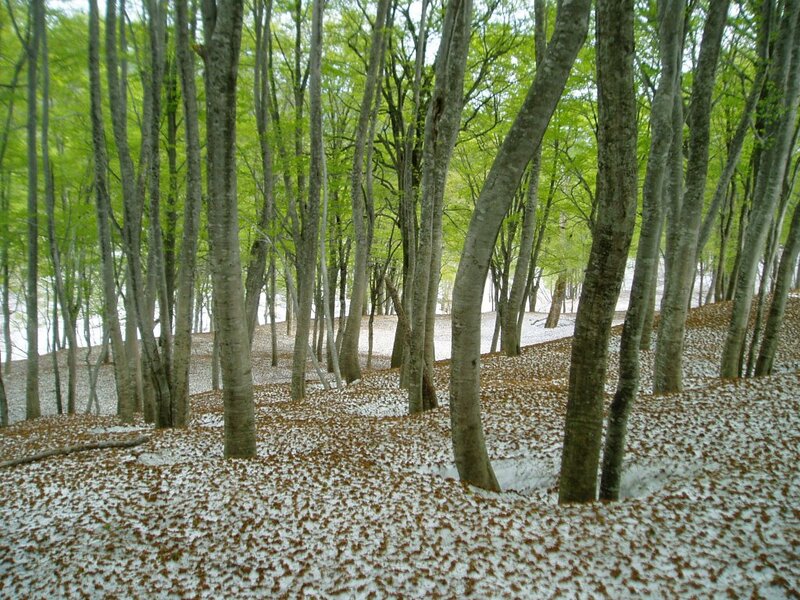 This is a phenomenon of the beech tree woods in Northern Japan. 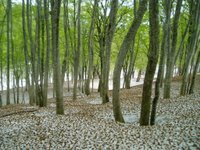 The small red leaves, which cover the buds of the beech trees during winter, fall on the snow when it gets warmer and the tree gets ready to produce new leaves. This might be as late as May. Click on the haiku to see them ! Rhus is a genus of approximately 250 species of flowering plants in the family Anacardiaceae. They are commonly called sumac or sumach. Some species (including Poison ivy, poison-oak, and poison sumac), often placed in this genus, are here treated in the genus Toxicodendron, which differs in highly allergenic foliage and grayish-white fruit but is not genetically distinct. The name derives from the Greek name for sumac, rhous. LOOK at some colored leaves ! It is generally said that horizontal distribution is the distribution of the vegetation corresponding to climatic zones, such as arctic zone, temperate zone and tropical zone, which are owing to the climatic conditions, such as temperature and precipitation, and the vegetation contains the needle-leaved trees, deciduous broad-leaved trees, ever-green broad-leaved trees, etc. The difference of such conditions are also contained as high humidity when hot in Japan, and as high humidity when cold in Europe. And is said that vertical distribution is the distribution of vegetation according to the height above sea level. The conditions of vertical distribution change owing to latitudinal difference. This generally means that what are at high places in the south are at lower places in the north, but the conditions of distribution are influenced by the accumulated temperatures and the underground moisture content except the average values of temperature and humidity. "In the region of the Himalayas, the upper limit of a rice crop is about 1800m, and that of bananas is about 2000m in Nepal and its neighborhood. Even in cold places where a rice crop cannot be grown, bananas can be cultivated. On the south side of the Himalayas it's warm in winter and fairly cool in summer similar to the character of an alpine climate in the tropics. As rice is the summer crop, the upper limit of rice is determined by the accumulated temperature in summer, on the other hand, that of bananas is determined by the coldness in winter. It is a strange phenomenon that bananas can be cultivated up in higher places." Physiographic factors and climatic factors also have influence on maple distribution. Let me show a few here. It seems possible for us to discriminate roughly among 3 species with the addition of o-momiji. But now as there are many kinds of cultivars in addition to these 3 natural species, it might be fairly difficult for us to distinguish accurately by the shape of a leaf when asked what kind it belongs to. They all are generally called "momiji." This species is from Ryukyu (Okinawa Prefecture), as well as Taiwan and Himalayas. The shape of the leaves is like that of camphor's leaves, which are non-lobed. This is the only maple whose leaves are ever-green in Japan (from document No.15). I hear this is similar to Itaya-kaede (Acer mono), and is rarely seen in Hokkaido and Tohoku District. I've seen this maple at the Nikko Botanical Garden, and I would like to meet this species at the place where they originate. Mine-kaede (Acer tschonoskii) could be seen at the Mugikusa Pass (2127m), the Shirabiso Highlands (1833m), Mt. Mizugaki, etc., Ogarabana (Acer ukurunduense) at halfway up Mt. Yakushidake, the Yachiho Highlands, halfway up Mt.Mizugaki and in the Shirabiso Highlands. Many species in addition to those mentioned above are distributed from1000m to 1300m. In Shizuoka Prefecture we can arrive at these places by a 2 hour drive from the Pacific Coast, such as Mt. Chausu, the Hyogoshi Pass, the Aokuzure Pass, Ikawa, Sumata Ravine, Umegashima, Mt. Minobu, Mt. Fuji and the Izu Amagi Pass. We can see the following species at these places. The natural maple which I saw for the first time was an Uri-kaede. My maple observation commonly started from the low place. Then followed Hananoki, Itaya-kaede, and the last ones were Tetsu-kaede, Ogarabana and Mine-kaede. To tell the truth, maple distribution maps by Prof. Ogata were my best guide for these personal observations. In the mountains there were many happenings, such as getting seperated from my wife, the wheel lifting from uneven spots, slipping down the slope, meeting deer and meeting monkeys with surprise. As mentioned above, we can observe 24 species in this Chubu district. 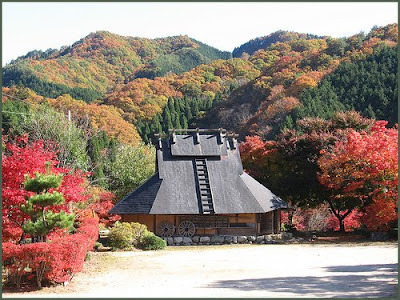 Let me show you autumn colors of the leaves on 24 species of maples in Chubu district. As species of the natural maples in Japan, including the following species, such as kurobiitaya (Acer miyabei), kusunohakaede (A. oblongum), yakushimaonagakaede (A. morifolium) and shimaurikaede (A. insulare) , 28 species can be counted. The count of species differs according to the scholar, I will regard the number of species as 29 here including tohkaede (Acer buergeianum from China). As regards the detailed examination of species, I'll add my explanation in the item called "Related items"
To see a list of "Japanese maples" !